Once an innovation on the Web catches hold in the market, there's often a "lock-in mechanism" that freezes out radical changes to that innovation. 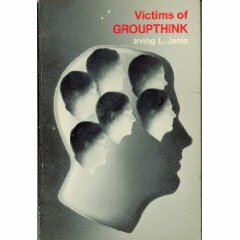 In the 1970s, Irving L. Janis's book "Victims of Groupthink" described it as "a deterioration of mental efficiency, reality testing and moral judgment that results from in-group pressures." In the Age of Social Media, where social networks like Twitter and Facebook have consumed our lives, has Digital Man evolved into the the current version of "groupthink" or the herd mentality? Social networks may be stifling because mass opinion-sharing can encourage groupthink. "An overabundance of connections over which information can travel too cheaply can reduce diversity, Viktor Mayer-Schönbergerfoster groupthink, and keep radical ideas from taking hold," writes network expert Viktor Mayer-Schönberger, noting, for example, that open-source software is rarely altered beyond simple enhancements. It is a known fact that social networking websites such as Facebook, LinkedIn, and Twitter can build one's online capital and reputation, but it also has a dark side that can stifle creativity and foster narrow-mindedness if you’re not careful. If we were to apply the 8 signs of Janis' "Groupthink" thesis to the social media space, it's interesting to see how these pychographic triggers might be affecting our networking conduct? * Invulnerability. Members of the group are so overly optimistic that they are willing to take extraordinary risks and unwilling to heed signs of danger. An example here might be the rallying cry we heard from the streets of Tehran and their access to the microblogging site Twitter which was used to amplify their protest message to the world. While on the one hand, using Twitter as a communication tool was eye-opening, might it have created a false sense of security? As the West joined the Iranian protesters online, did we put people at risk? I myself was approached by several of my LinkedIn contacts to remove Twitter profiles from blogs that I had posted that listed Iranian Twitter account names. * Rationale. They rationalize away negative feedback and warnings that might otherwise cause the group to change course. Are we encouraging children to be intellectually curious or merely teaching them that every question has an instant and obvious answer? Does Google or Twitter Search make us less intellectually curious as we rely on their easily accessible database of knowledge? * Morality. So convinced that they are on the right side of the issue, they ignore the ethical or moral consequences of their decisions. When people spend so much time communicating with others through a computer-screen, they lose face-to-face social interaction skills. A significant part of how people communicate with each other is through body language and facial expressions. When that aspect of communication is removed its easy to view online interaction as less personal and more disposable. We may become less inclined to feel compassion, empathy or do the right thing on behalf of others we meet in the social media space. There is a tendency to be more spontaneous, less thoughtful and more misunderstood as result. * Stereotypes. The group sees opponents as so evil, weak or stupid that they are not worth negotiating. There is a tendency for a black and white interpretation of the facts, lacking nuance of interpretation or analysis. This is the viewpoint of the fundamentalist. It is a slippery slope when one starts to believe in the ancient adage "so it is written, so it shall be." Once opinions are expressed in 140 characters or less, people have a hard time taking back their words. Those that do are considered less trust-worthy, and may be shunned by the group. * Pressure. Any member of the group who expresses doubts about any of the group's shared illusions is pressured to keep silent. We have fallen in love with the term “meme” which in the web context is a piece of cultural information or basic idea that travels from one person to another, and along the way the idea is mutated and adapted by each sender, the idea equivalent to genetic adaptation. It's similar to the old kid’s game of whispering a sentence in one person’s ear and having it pass from one person to the next until the final version is totally changed from the original. We somehow have put “this is a good thing label” on this form of idea bending. * Self-censorship. Members of the group avoid deviating from the group consensus, and even suppress doubts in their own minds. The very nature of social networks encourages users to provide a certain amount of personal information. But when deciding how much information to reveal, people may not exercise the same amount of caution on a Web site as they would when meeting someone in person. Consequently we let our guard down more often online. * Unanimity. Members share an illusion of unanimity, in part because those who have doubts keep them to themselves. Thinking becomes simplified, where we are less inclined to go against the grain. Conformity is an easier path to tow and makes us feel more apt to follow the leader. An example here is how we follow the "trending" topics on Twitter, so much so that we might stop everything else just to "chime in." By acknowledging what 'appears' to be important to others shows that it is also important to us, whether or not we gave it any thought at all, prior to it appearing as a trending topic. This allows us to feel like one of the team. * Mindguards. Members sometimes appoint themselves as mindguards to protect their leaders and fellow members from doubts about their decisions. This speaks to cyber-bullies, those that will defend a cause vehemently to the point of suppressing the thoughts of anyone else who might disagree. Think about all the 'experts' you have uncovered on social networks that are held in high-esteem because they have a legion of followers. One defends these 'superstars' because they are believed to have all the answers. Otherwise, why would so many people be following them? We learn to not question their authority. If any or all of these symptoms ring true with you, perhaps it is time to stop and think how we are all using this great tool called social media. I, myself am an avid fan of Twitter, and find myself at times aligning myself to 'groupthink' just because its sometimes an easier path to persue. But when I take a step back and analyze my true feelings, I realize that it's not beneficial to me nor my followers to "follow the pack," particularly when I have a difference of opinion. So perhaps in countering consensus-thinking, we consider some alternatives. To do this, someone in the group has to be critical. According to Adrian Gaskell, Content Manager at CMI, Adrian Gaskellhe thinks that "encouraging critical thinking is not easy, but it is possible" And he offers up the following suggestions. Devil's advocate - Someone in the group has the role of playing devil's advocate, poking holes in the decision making process. The power of authentic dissent - Sometimes the devil's advocate isn't believed because they don't really believe the points they make. An authentic dissenter doesn't have these problems. Nurturing authentic dissent - Leaders play a key role here in encouraging dissent. The most recent example of 'groupthink' in modern-day history in my opinion was the Bush Administration. where even the term 'neo-conservatives' inferred fundamentalism. Here was a group of elected and non-elected officials whose world view strictly adhered to the black-and-white execution of all issues from war, to oil, to compromising civil liberties. As with most new Internet technologies it’s up to us to choose how to use the power, so let’s engage with it wisely, less we fall down the same rabbit hole over and over again! Please voice in. Let me know your thoughts on this topic. Take our poll and post your comments. 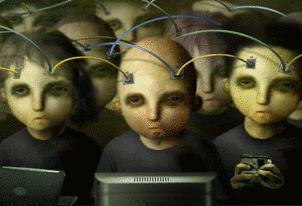 Does Social Media produce "groupthink"? Very interesting concepts and article Ron. I'd like to add that groupthink is specific to the medium, and results should be calibrated to each. Consequently, when you enter into this type of discussion it would be a good idea to temper it with the "fractured effect." It is a given today that the internet fractures markets, consider the music and newspaper industries for example, and it is now doing the same with society. Critical mass today means something different than it did pre-internet. Critical mass literally means a large group, at a minimum 50% of your target group, thinking and eventually responding the same way. As a result of the internet fracturing large groups, critical mass is also fractured. "Fractured mass" is a more accurate contemporary term and the new barometer. Relatively speaking, Twitter is a tempest in a teapot. Even if you have 100,000 followers, it is unlikely they are following you at the same time you post, which makes it hard to gain momentum. Fundamental rules of change management have not changed, only the tools. Humans are affected the same way by psychological stimulus regardless of whether it is broadcast, pointcast, or face to face. How you channel and manage the feedback however is different. The secret to advancing a change of thought across a group is to get EVERYONE moving forward at EXACTLY the same time. If you don't achieve this continuum, it is doubtful you will generate momentum, and momentum is necessary to drive change or spur someone on to make a decision that challenges their old line of thinking, and as a result shift group perception. I note the Bush Administration critique at the end. I am also a critic of the Bush Administration and the harm I believe they committed. However, it must also be said that groupthink emerged among Bush's opponents, too, to the extent that we began talking about Bush and, particularly, Cheney as if they were evil incarnate. It was another sort of black & white fundamentalism. Still us vs. them, but with a different them. But that is a model of persuasion that is outward looking in direction, persuasion, not groupthink. When the thin, fractured branches can begin to reinforce each other, "refine" out inconsistencies, and send off new branches that simply loop back to support other branches, that is the social network model of groupthink. And while psychological fundamentals may not change that much, the sheer velocity of social networking is a game changer that enforces the fracturing and also exploits it. I would argue that the fracturing you describe actually increases groupthink, because people don't take enough time to think about an idea before it is retweeted, forwarded, or commented. As a result, people buy and resell an idea before they've properly evaluated it, then feel the social pressure described in the article to be consistent, holding onto a bad idea. Great article, and I hope this discussion bears fruit! I saw yesterday that a recent poll (I don't recall statistical validity-and doubt poll's authenticity) that asked who the next Walter Cronkite might be resulted in 44% naming Jon Stewart. Perfect example of negative aspect of groupthink. I like your tree branches metaphor Aaron. My (past) background is in entertainment, promoting CDs and concert tickets. In that game the challenge is to manufacture groupthink. Since the mid/late 90s when MP3 came on the scene it became increasingly difficult to create the momentum an artist needs to break the Top 10 charts. In the last ten years the indie music market exploded and created hundreds of genres making it harder for elite established artists to hang on to their "pigeon-hole" following. It is still possible to create groupthink as evidenced through artists like the Jonas Bros, B Spears or American Idol, but over the last decade music consumers now have many more choices and are not subject to the same condensed influence by the now defunct big 5 record labels. So the question is, what comes first, persuasion or groupthink? Also, I realized something over the last five years working the Olympic market. Organic homegrown persuasion cannot be generated solely by injecting accurate information into the stream. The fundamental rules of change management still apply regardless of whether the information is right or wrong. Groupthink in this instance is impacted by a series of "persuasions." I'm also starting to more easily recognize the differences between organic groupthink and artificial groupthink, and more importantly how they overlap. One more small point Aaron. It's probably more accurate to think of the concept I described in my first post as a forest of saplings, as opposed to one large tree with branches. And to take it to the next level, think of the saplings as aspens that propagate through their roots. When you see an aspen forest it is often one tree connected through a hidden root system, but with independent trunks and solar collectors (leafs). Interesting commentary. Most people tend to be followers, it is much easier to tweak something existing than it is to create something new. I also adhere to the 'going with the flow' comment made earlier. Many people follow, because the idea they are following strikes some chord. They more or less accept/except the originator knows what she/he is talking about so they go along. I'm not sure that social media is any worse than most things in life. Most companies follow other organizations lead. They do not create original products. Once someone accomplishes something, many people realize it is possible. No one ran a four minute mile until Roger Bannister broke the record. After that many elite runners were able to cross that threshold. That is a good type of threshold break through. Most of the time it is harmless. But sometimes the herd mentality is ugly. In high school kids gather in cliques. One of two leaders the rest of the pack following along. They can range from the simply unkind to much more aggressive behavior to people outside the clique. The comments made about herd mentality or more scary. Because people are not giving deep or critical thought to the matter at hand. They act without thinking...and that can be very frightening. Interesting discussion....hopefully I did not run too far afield. This idea really made me think. I agree with Aaron Andersen about the idea about the importance of speed affecting the level to which people "think before they tweet" is a smart and interesting observation. From what I've studied in psychology classes, it is also true that acts such as signing documents or publicly supporting a point (support by retweet in this case ;) lead people to more adamantly support and believe in that position. That said, something else I remember from one of my college psych classes was that the effects of groupthink were diminished when people were not discussing with each other face-to-face. If I remember correctly, the reason for this was that non-verbal reinforcers were missing which gave people more confidence in fighting and voicing their own concerns and ideas. Online media not only makes it easy to avoid or miss nonverbal communication (unless dealing with video conferencing of some kind) but can also make it possible to be more anonymous a other times. Thus there is a very interesting splash of contrasting effects and it is not so easy to determine how it would ultimately play out. I wonder... lol, I'm going to be chewing over this one for a while :P!